Commander Bobby Owen of the Yard is on his way to visit Willoughby Wynne, concerning a gang of thieves operating in the immediate rural neighbourhood. But when murder comes, amid the loganberry bushes, it is a suspected blackmailer, not gangster, who is found strangled. Mr Wynne demands to be considered a suspect himself, but the list isn’t short. It seems more than one person in the district has been living a double life, one they are anxious to protect. And among the petty feuds, petty criminals and respectable gentry, a criminal mastermind is moving anonymously, pulling strings. Bobby will need a very large pair of shears to cut them this time. 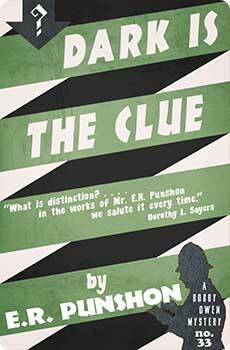 Dark is the Clue is the thirty-third novel in the Bobby Owen Mystery series, originally published in 1955. This new edition features a bonus Bobby Owen short story, and an introduction by crime fiction historian Curtis Evans.